When coming to the end of a book, you’re often feeling a jumble of emotions. If it’s a romance, you’re feeling the Happily Ever After. A dystopian, probably a little misery mixed in with hope. Across all books of all genres, there’s one thing in common: That all-important book back matter and front matter. Your book’s front and back matter is, essentially, the stuff that bookends the actual text of the book. The title page, your copyright information, and table of contents goes in the front, your acknowledgements, your also by, and your biography go in the back. If you’re a self-published author, all of these components make for yet another sales avenue. For indies, you’re going to want to have at least three main components to your front matter: Title Page, Copyright, Table of Contents. You could go for the gold and have all the components (half title, series page, title page, copyright, dedication, epigraph, table of contents, etc). However, keep this in mind: Nobody’s buying a book to read the front matter. Especially when it comes to eBooks, where you can display up to 20% of your book to potential customers, you don’t want 10% of that taken up by front matter. Our eBooks run about the same way, although we don’t add the blank pages. Per the Smashwords formatting guide, we also make sure to add the appropriate text so we pass muster on the Meatgrinder. Amazon’s Look Inside feature allows users to view the interior of an eBook prior to purchasing. For a lot of consumers, that’s how they decide to press that Buy button. Recently, however, Amazon pushed a new standard for eBooks in the Look Inside feature that effectively broke a lot of formatting, especially as it relates to images and text alignment. All of our books, formatted through Scrivener, were victims of this change. If you’re a Scrivener user, try exporting the book to ePub instead of Mobi. You might also try Vellum, which is another eBook formatter (Runs around $200 for eBook only). Either way, it’s important to check your Look Inside feature every couple of months to make sure everything looks as it’s supposed to. Right after the last page of the book, you need to try to hook your reader to take an additional action, whether it be purchase the next book in the series or signing up for your newsletter, or even leaving a review. The more pages a reader has to sift through, the less likely they’ll hang around, so put your high priority up front. As always, thank you, dear reader, for going with me on this adventure. As an indie author, I rely on my awesome folks like yourselves to help share the word about my work. Please consider leaving a review on your favorite book retailer*. I am so excited to hear what you think—even if it’s a short review! Sign up for the S. Usher Evans newsletter and get a free copy of Empath, a standalone fantasy novel about a girl and her anxiety dragon. Also By with links to each book in the backlist, and a notice if the book is also a free download. 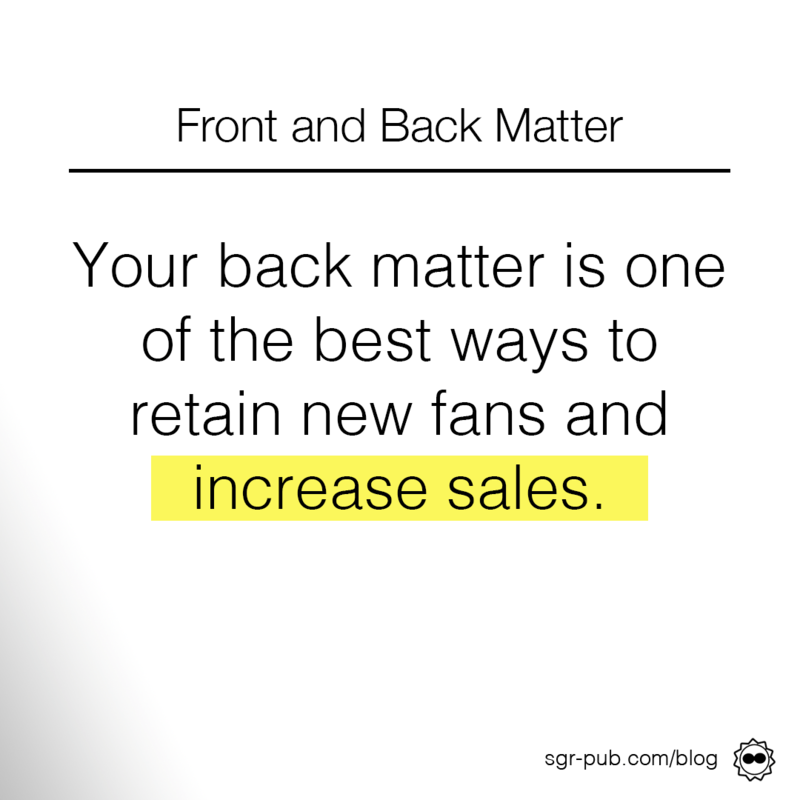 If it’s not completely obvious, your back matter is one of the best ways to retain new fans and increase sales of new books as they come out. Whether it’s through finding you on social media or signing up for your newsletter, giving fans a one-click option to get more of your stuff is always important. Especially if you’re giving the first book away as a freebie or newsletter gift, you want to give yourself every possible chance to keep your hard earned fans. We also recommend linking back to your own website, versus trying to do store sites. In the first place, if you’re using Smashwords or other distributer, you won’t be able to upload a different book for each store. But most importantly, it lets you link to books that might not be out yet. So if you’re planning books 3 and 4 later in the year, you won’t have to update your backmatter when they come out. That also means that every so often, you should be updating your back matter with information about your new and upcoming books. If you’re a habitual releaser of 4-5 books per year, you can probably get away with once a year for heavy lifting. It’s also a good time to sweep across your paperbacks and hardcovers to make sure everything looks good, too.